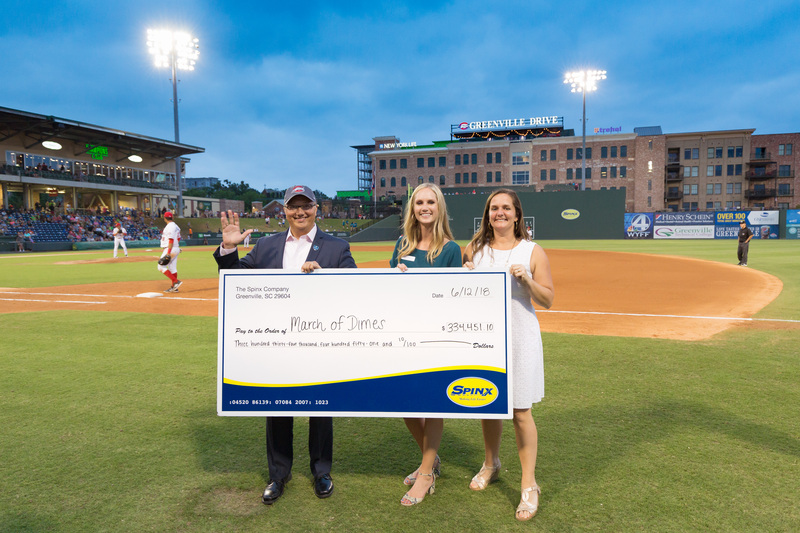 SPINX, the Greenville, S.C.-based fuel and convenience retail company, is pleased to announce that it raised $334,450 for the March of Dimes, shattering its goal and nearly doubling its record last year of $180,000. In addition to the company campaign, SPINX also donated a year of free gas to recognize the hard work and dedication of individuals who raised significant funds during the March for Babies. The March of Dimes presented Sara Beth Settle with a year of free gas in recognition of her passionate work and commitment to the cause. After losing her daughter, Leona, at 29 weeks earlier this year, Sara Beth turned to the March of Dimes and personally raised $5,260, and her team raised $10,300 to honor Leona. Throughout the 10 years SPINX has supported March of Dimes, it has raised more than $1,000,000. As a community-centric business, SPINX is dedicated to supporting local organizations that focus on improving the lives of children in the communities it serves. The money raised each year during the March for Babies campaign helps area moms have healthier pregnancies, assists families with newborns in the Intensive Care Units, and helps fund research to fight birth defects and premature birth.